Wine vinegar is an increasingly appreciated product in Europe and some high-quality vinegars have been certified with “Protected Designation of Origin” (PDO) to preserve and control their production methods. Spain has three of the five PDO wine vinegars existing in Europe. A tentative study was carried out to assess the utility of stable isotope analysis (δ13C and δ18O) for the characterization of those Spanish wine vinegars and if the values obtained could be used as a fingerprint of their geographical origin compared with other regions. 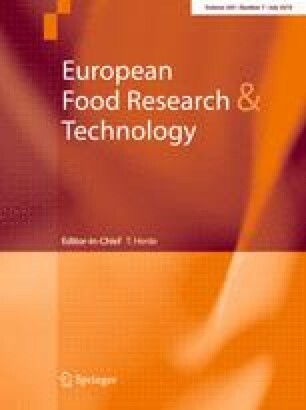 A total of 35 wine vinegar samples, belonging to the three Southern Spain PDOs and three Northern Spain non-PDO regions, were analyzed for their isotopic composition. Our analysis revealed that most of the Spanish vinegars presented δ13C values that were in agreement with some other isotopic studies about Mediterranean vinegars, since all the samples were under − 20‰ and the vast majority of them were below − 24‰. On the other hand, the δ18O analysis confirmed its utility for discriminating all the Spanish vinegars according to the three geographical coordinates (latitude, longitude and altitude). Positive mean values were associated to Southern vinegars (2.16 ± 1.59‰) and negative δ18O values were related with Northern vinegars (− 2.93 ± 2.82‰). We also found a highly significant (p < 0.001) correlation of δ18O with altitude (R2 = − 0.48) and longitude (R2 = 0.36), which allowed us to conclude that δ18O analysis could be used as a fingerprint of the geographical origin in Spanish wine vinegars. Clemente Ortiz-Romero and Rocío Ríos-Reina contributed equally to the paper and are listed in alphabetical order. This work was supported by the “Consejería de Economía, Innovación y Ciencia, Junta de Andalucía” under the project P12-AGR-1601. We thank the Regulatory Councils of each Protected Designation of Origin—“Vinagre de Jerez” (“Sherry wine vinegar”), “Vinagre de Montilla-Moriles” and “Vinagre de Condado de Huelva”—for supplying the wine vinegar samples. We also acknowledge the Mass Spectrometry Services (Stable Isotopes Laboratory) of the Autonomic University of Madrid for the isotopic analyses and the mass spectrometry instruments (Dr. Ramón Redondo and Dr. Vanessa Peiro). No humans nor animals were involved in the study.